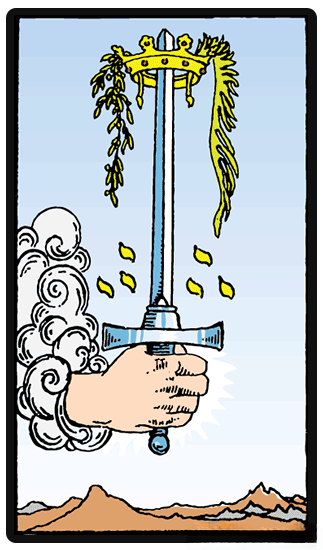 The Ace of Swords shows a hand emerging from the clouds wielding a double-edged sword. This double edged sword carries a golden crown while being encircled by a wreath. The wreath has for a long time been associated with victory, success and great achievement. The crown is used as the symbol for both royalty and the power to rule that comes with royalty. Behind the foreground, the sword stands floating over a varied setting - which holds both mountains and sea, which are used as symbols of the vast reach and distant lands that the swords can be used to conquer, as well as ambition. As with all the aces, the Ace of Swords indicates that one is about to experience a moment of breakthrough. With its sharp blade and representing the power of the intellect, this sword has the ability to cut through deception and find truth. In layman's terms, this card represents that moment in which one can see the world from a new point of view, as a place that is filled with nothing but new possibilities. It is, therefore, the best time to work on your goals - as the aces all give green lights, and are signals of waiting opportunities and new beginnings. The Ace of Swords indicates that one is about to experience a moment of breakthrough. It might also be a good time for you to seek justice and the truth in all matters since your conscience is clear, and your thoughts are swift. If you rise to the occasion, your sharpness and clarity in thought will be rewarded. When we look at the swords closely, and see its double-edge, we are also reminded that this sword may be either used for noble deeds or to deal destruction. It all depends on the wielder, and is a warning too that excessive power holds the danger to corrupt. If you stick with principles, the sword will serve you well. Getting a reversed Ace of Swords might mean that one's thoughts are confused, unsure and very chaotic. This isn t a good time for one to make any decisions since they don t have any clarity on what you should be doing, meaning that the chances of failure can be pretty high. At this time, it would be better to prepare yourself and take baby steps - work methodically as you slowly move towards achieving your goals. This would be a good time to lay back and rationally think your way through each stage rather than acting on impulse, since everything appears in a blur and is not very clear at that moment. It might also be a good time to seek advice since things may not be as they seem.